The majority of the scholars believe that drinking or eating with one’s right hand is mustaḥabb and to eat or drink with the left hand is considered makrūh tanzīhī, except in the case of necessity or a valid excuse, in which case it is not disliked at all. A group of Mālikī and Ḥanbalī scholars however, held that to eat or drink with the left hand was ḥarām because the action of doing so has been attributed to shayṭan or his like. As for the expression that shayṭān eats with his left hand, some scholars believe that it is not literal and that it means that shayṭān entices such people to eat with their left hands. 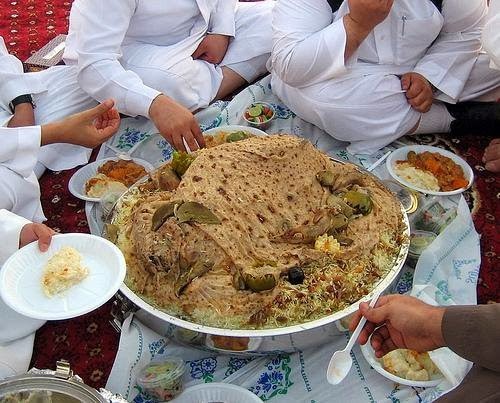 Ibn Ḥajar quotes Ṭībī as stating that the meaning of the ḥadīth is that shayṭān induces his human friends (awliyāʾ) to eat in such a manner so as to oppose the pious slaves of Allah. In other words, “do not eat with your left hand, otherwise you will be considered of the awliyāʾ of shayṭān, for shayṭān entices his friends to do so.” Ibn Ḥajar, however, disagreed with this interpretation and prefers to understand the ḥadīth literally, because logically there is no reason to deny the possibility that shayṭān literally eats. In fact, prophetic narrations prove that he literally eats, so there is no need to resort to figurative interpretation. In this opinion, Ibn Ḥajar is supported by Zarqānī and Ibn ʿAbd al-Barr. Qurṭubī, however, provides two possible interpretations and does not clearly express his preference of one or the other. The first is that the ḥadīth is literal and that shayṭān can actually physically eat with a person, and then he quotes the ḥadīth of Muslim that states that when someone fails the mention the name of Allah on food, shayṭān makes it ḥalāl for himself, which proves that he actually eats ( although some interpret this ḥadith to mean that doesn’t actually eat but he finds pleasure in the absence of barakah in the food that results from failing to mention Allah’s name). The second interpretation is that the ḥadīth simply means that by eating with the left hand one is imitating shayṭān. This would imply that shayṭan doesn’t literally partake of that particular meal but by eating like a shayṭān, one is figuratively representing him. The problem with a figurative interpretation is that it doesn’t account for the numerous narrations that apparently prove that shayṭān and jinn eat, drink, sleep, and even marry. In fact, many scholars agree to this idea. In a long discussion about the jinn (the evil amongst them who are also called shayāṭīn), Ibn Ḥajar notes that there is a difference of opinion about whether the jinn eat, drink, and marry. Some argue against it while others disagree, although they are not agreed about the modality of their eating or drinking. Some think that it is some sort of respiratory action, through smell or inhalation, not chewing or swallowing. Lastly, some scholars differentiate between different types of jinn, mentioning that some are of a nature that they eat, drink, and wed just like men, while others do not. Details can be found in books devoted to the topic, such as Badr al-Dīn al-Shalabī al-Dimashqī’s Ākām al-Marjān fī Aḥkām al-Jānn, which is an unparalleled book on the subject of jinn.